Day one we visited the Magic Kingdom. 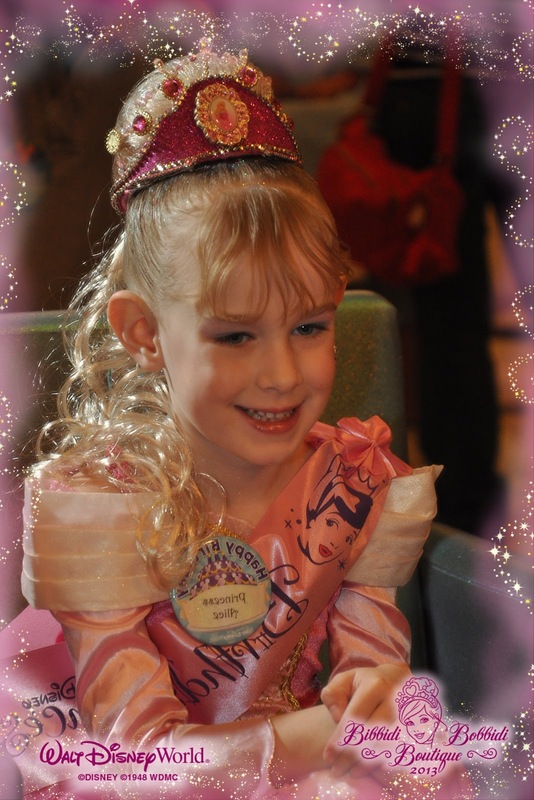 We had reservations at the Bippity Boppity Boutique for Alice's transformation into a Princess, so until our reservation we made our way to the new Fantasyland to play a while. First we rode Prince Charming's Carousel, then we met Ariel at Ariels Grotto and got Alice's first autograph of the day. After that we rode the Journey of the Little Mermaid. By then, it was time to head for Alice's princess appointment. The Bippity Boppity Boutique is located within Cinderella's Castle. 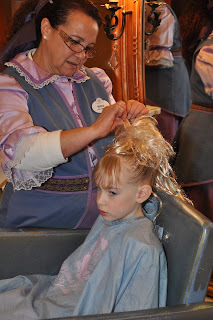 While Alice was getting her makeover, the Fairy Godmother was flitting around supervising the transformations. 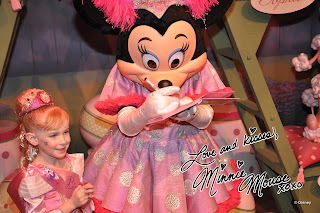 Alice got to met her Fairy Godmother and got her second autograph of the day. 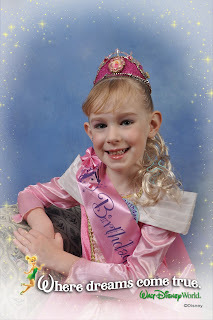 After Alice was princess-ified, we took her official Princess Pictures, and then continued our tour of Fantasyland. We rode the Mad Hatter Teacups, Dumbo, the Barnstormer, got 4 more autographs for Daisy, Minnie, Donald and Goofy. We then headed to ride the Peter Pan adventure and It's a small world. By this time, it was getting close to our reservation at Cinderella's Royal Table at the Castle. We were cordially invited to dine at Cinderella's Castle. We first had a photo and autograph session with the Princess Cinderella and then went up the grand staircase to be seated at the Royal Dining Hall. Some of Cinderella's princess friends came to greet the diners. One at a time, each was introduced and upon hearing who was coming, Alice began to clap and shout their name. 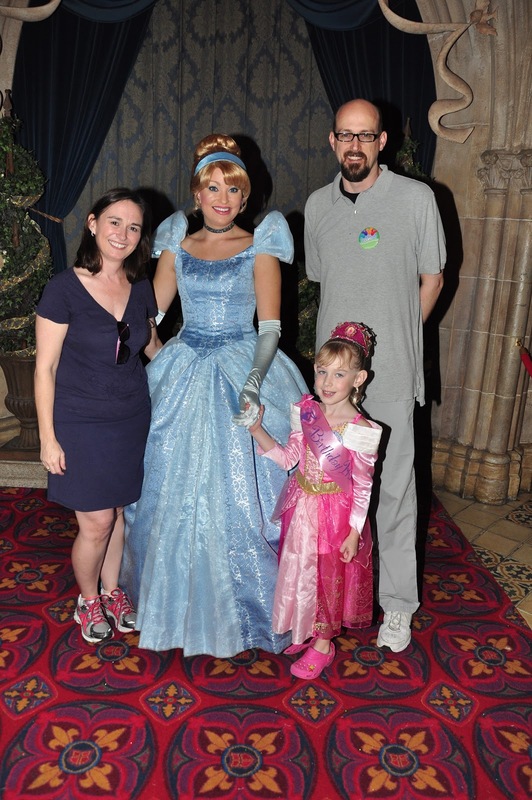 I'm not sure how or why, but each princess came directly to our table to meet Princess Alice - FIRST. First was Snow White, then came Aurora, then Ariel (as a human this time) and then Jasmine. Since Alice was dressed as Aurora, she got a special kiss from Aurora on the cheek. Each princess took the time to talk to Alice, and really made the day special. After dinner, we found ourselves near The Haunted Mansion. I had told Alice that I especially remembered this ride from when I visited DisneyWorld as a kid. We rode it 2 times! Then we started to try and find our way out of the park, but instead found ourselves at Thunder Mountain, so we decided to ride. By this time, it was getting close to the fireworks, so many people were lined up to see the parade and fireworks. Alice liked Thuder Mountain also, so we rode it twice before the fireworks started. We made our way out of the park while the fireworks were going off. Larry carried Alice so she could watch the show.